New Japan Pro Wrestling held their 47th anniversary event this morning at the Ota City General Gymnasium in Tokyo. Here are the results. Kevin Kelly and Colt Cabana were on commentary this morning, with Don Callis coming in after the second match. Pretty decent opener. People got into it when Makabe came in for the hot tag. Yoshida went at it with Chase Owens, but it was the usual finish --.Owens getting the win for his team with the package piledriver. A tale of two matches, as Nagata and Ishii mainly worked against one another while Henare and YOSHI-HASHI paired off. This was pretty good and stiff whenever the former were in, with the action still being good with the latter. YOSHI-HASHI won the match for him team with a new move, which can be best described as a fisherman’s suplex into a brainbuster. This was fun. The interactions between Suzuki and Kojima were great. Kojima chopped the hell out of Suzuki’s chest to the point it was bleeding. Taguchi and Taka were tagged in. Taguchi hit the running hip attack but Taka kicked out. Taguchi then pinned him with the dodon. Good match! Crowd was big on RPG3K getting the win and they got it, while having a good back and forth match. RPG3K started off strong, sending the champions to the outside and hitting stereo tope con hilos to the floor. Shingo cut off SHO with a big lariat and took him to the floor where he threw him into the barricade. Crowd very much got into RPG3K as babyfaces as Shingo worked over SHO. YOH comes in and starts to target Shingo’s knee, connecting with a couple of dragon screws. After their partners worked against one another, Shingo and BUSHI worked over SHO. They went for Rebellion but YOH ran in and cut them off. RPG3K hit double knees on Shingo and went for the 3K on BUSHI but he countered with a double hurricanrana. He hit a suicide dive on YOH as Shingo comes in. BUSHI straight up shoved the referee to the floor and misted SHO. They then connected with Rebellion but YOH broke things up. 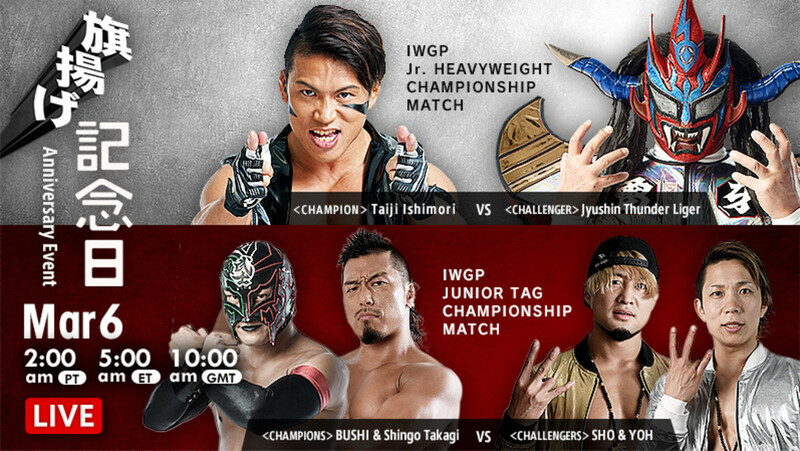 SHO dodged an MX, and when BUSHI went for it again SHO instead held him up as RPG3K hit the 3K, with SHO pinning BUSHI to win the titles. Really good match. No move was completely bonkers or anything but Liger and Ishimori went out there and had a nice, solid match that worked well for this show. Liger, at over 50 years old, knows his stuff down pat and it always gets over, as evidenced by this white hot crowd. Liger started off early taking down Ishimori and applying the surfboard, then the Romero special. Ishimori cut him off with a springboard kick then took him to the outside, where he threw Liger into the barricade. Liger counters with a baseball slide then a running senton to the outside. Liger connected with a brainbuster near the entrance ramp. Back in the ring, Liger hits the shotei palm strike and a hurricanrana off the top rope for a near fall. Ishimori countered a Liger bomb attempt with a DDT. He hit what would be considered a reverse codebreaker, but Liger kicked out. Liger came back to life and hit a Liger bomb but Ishimori blocked the koppo kick and sinked in a crossface. Liger fought it for a while, but did manage to make it to the ropes. Liger caught Ishimori with the roll-up that pinned Ishimori in the last tour then followed it with the Thesz press but Ishimori kicked out. Ishimori then sank in the Bloody Cross once again, rolling him back to the middle. Liger had no choice but to tap. Ishimori said he would like to have a title match at MSG and called out anyone from ROH to accept. Dragon Lee came out instead, saying that he isn’t representing NJPW or ROH, but instead CMLL, and he wanted the challenge for MSG. Ishimori accepted, so there’s your next Jr. title match. Another good match. Things started off hot with a Kazuchika Okada/Tetsuya Naito sprint. Okada at one point was in control and took out all of LIJ with some DDTs. Okada went for the elbow but EVIL dodged and hit a fisherman’s buster for a nearfall. EVIL tags in Naito who runs wild briefly until Goto comes in and clears everyone out. He and SANADA trade blows until Goto grabbed his legs and somehow folded SANADA on top of himself, scoring the pinfall win. A really good main event. I’m not sold on White as a headliner but Ospreay held up his own and it ended up being good, though I think it may be a tad below from their ROH match a few years ago. White stalled early. Ospreay took out With with a crossbody to the floor, but Gedo got involved, which led to White finding an opening. He keeps in control, working over his back and ribs. Ospreay finds the right moment to hit the space flying tiger drop, but it's clear that his ribs are bothering him. Ospreay goes for a suicide dive to the outside but White grabs him in mid-motion and sends him into the barricade, clutching his ribs. White takes him to the top rope but Ospreay connects with the cheeky nandos kick. Ospreay goes for the Stormbreaker but White counters and the two have an exchange. Ospreay takes White in a electric chair position, climbs up to the middle rope and slams him with an iconoclasm for a near fall. Ospreay goes for the ozcutter but White grabs him and laid in the elbows. White went for the bladerunner, but Ospreay countered into a reverse rana and the big elbow blow to the head. At this moment, Gedo ran in. Ospreay got distracted, which led to a low blow and a half nelson suplex. White came back with a giant sitout powerbomb and the imploding 450 splash but White grabbed the bottom rope. Ospreay tries for the Stormbreaker again but White managed to escape. Ospreay went for the ozcutter again but instead White slammed him on the mat with a variation of the bladerunner, then landed the move proper for the win. Gedo came into the ring with a chair after the match as White was about to attack Ospreay but Kota Ibushi, who was on commentary, came into the ring and stopped it. Before he could act further, the rest of Bullet Club came out to attack. Tanahashi, Okada and Goto came back for the save. White had a long stare down with the four before leaving. Ibushi brings Ospreay to his feet as suddenly, they all realize they are in the New Japan Cup! They all point to themselves and look at the crowd as the show came to a close.